- all incl (No hidden extras). Water softeners are not water filters. Unlike filters, softeners don't improve the taste of the water. So if you only have a water softener you will still be drinking and bathing in chlorinated water. Now we can combine your water descaling needs with a powerful Whole House water filter. This will remove unpleasant tasting chlorine and greatly improve the quality of your drinking AND bathing experience. Buy both units together and we will give a £100 discount to the next few customers who order the combined no-salt softener and whole house water filter from us. (Usual price £597 - Special Deal £497). Combined these give you a unique solution: a water softener PLUS filter that gives you all the benefits of scale-free water with mineral bottle drinking quality water throughout your property. The Scale Centurion cartridges cost £147 to replace and last for 2 years. (That's £1.41 per week). Outstanding value and ease of maintenance compared to salt softeners. Scale Centurion softener media has been fully tested using the DVGW-W512 protocol. (DVGW is the top gas and water industry certification body in Europe). Plus; the media has been fully tested by Arizona State University against the international protocol for scale prevention. Achieved a 99.6% effectiveness rating - the only non-salt based anti scale technology to do so. This standard size whole house unit accepts a max flow rate of 20 litres per minute. This is adequate for a normal size home ie with 4 bedrooms and average water usage. Larger properties with 3 or more bathrooms will need a higher flow rate (Click here to see this unit now). Sent by special courier from our UK Warehouse. Fully insured. We are so confident that you will be delighted with your new unit that we offer an 18-month performance guarantee. (Please note you must choose the right size unit for your property). 1) The Scale Centurion softener media will last you for at least 2 years - most likely three or more. (It might be longer depending on your local water conditions. You'll know when it's time to change because you'll see scale slowly building up in your kettle etc). The replacement anti-scale media costs just £147. (It will last you a further 2 plus years ie the same time as the original did). We will send you a free reminder when it is around the time to renew your softener. All you have to do is change the cartridge. It only takes a few minutes. 2) The whole of house filter media will last you 12 months. After 12 months we send you a free reminder. All you have to do is change the cartridge. (it's similar to changing a large lightbulb - it should only take a few minutes at most. Your new cartridge costs £97 and will last you a further 12 months. So you get beautifully filtered water throughout your home for less than £2 per week! All you have to do is change the cartridge. It only takes a few minutes. Recyclable... ... you send back the old cartridges. We can re-use them. Fitting the new unit would require a plumber to put it in line with the relevant water supply. Each housing unit is 14 inches high. Add the fixing bracket which reaches up 5 inches and the total height is 19 inches. (You get TWO of these housing units in this combination). If you have a tight space make sure to allow some clearance room underneath the fitted unit for changing the filters. The blue bowl unscrews down from the black head. If you are fitting the unit in a restricted space, for example in a standard kitchen cabinet / under your kitchen sink, make sure to allow a minimum of 2 and a half inches below the blue bowl for it to drop down and slide away. For a softener and filter this powerful this is extremely compact. It should fit within a narrow kitchen base unit or small cupboard. These whole house filters require no electrical or other power or salt and can be left to produce super quality water throughout the home and garden. This standard whole house unit accepts a max flow rate of 20 litres per minute. This is usually adequate for a normal size home ie with 3 or 4 bedrooms and average water usage. We do any size property but please contact us to discuss and confirm your needs. Thank you. Water filter fitted neatly under sink, very pleased . Early days, but lime scale build up seems to have decreased. It is wonderful to drink straight from tap. Water does seem softer, already using less shampoo. Order recieved promptly and straight away we have noticed a change in the water it also looks like there us a lot less lime scale as the taps where cleaned when we put the filter in and a week an a half later they do not have lime scale marks yet. Usually this would show pretty much straight away. Our filter has been in for 8 months and it is simply amazing. There is no scale in the kettle anymore and we have always had scale even with a Britta filter. And to crown it all the Hot Tub auto clorinator is working a treat. We always used to replace this every year as it would always clog up and fail even using a portable "Salt" water softener. So thank you so much - recommending you to all our friends. I would just like to thank you for the time you spent on the phone with me prior to purchasing the whole of house, water filter and anti-scale system. The plumber found the whole process straightforward and I love the robust nature / simplicity of the solution. Although back in July I was asked for feedback on my experience using your equipment I have waited until to allow everything to settle down. Firstly, the ordering and delivery was very simple and the filter arrived in good condition. Your prompt response to my query was appreciated and our plumber found the installation procedure very simple and quick. We are both amazed at the results after the filter was installed. Sinks, taps, kettles, in fact any surface that comes into contact with water, are so clean and only need a soft cloth to keep the results. Waste pipes that needed regular attention with washing soda have not needed treatment since the installation and baths/sinks/ showers only need further cleaning every so often. Have to be careful with shower gel, shampoo and washing up liquid as very little now required or too many bubbles! Even the kettle, without that little wire device, not needed attention since the installation and we have also discarded our water filters as they are now completely redundant. Having suffered from the effects of hard water for over 30 years we are delighted with the results of the filter and believe it was best value for money we have ever enjoyed. Thank you for your help and we hope your company continues to prosper. We are certainly doing our best as we have regular ‘tours’ of the equipment for friends and neighbours! I live in Hemel Hempstead where the water here is really hard. Before I had the filters fitted, the glasses and cutlery came out of the dishwasher completely smeared and covered in scale. The difference is amazing. Really impressed and will be recommending this product to my in laws. We've had the filters for a couple of years now. It's definitely improved the water. I never drank from the tap before but am more than happy to now as the filter's made it taste so much better. The water in our area is very hard and the filter has improved the limescale. It's certainly not as bad as it used to be. We're very happy with it. Very very good service, helpful friendly, quick service. Waiting for our plumber to fit the filter. Will update comment on here once it is up and running. 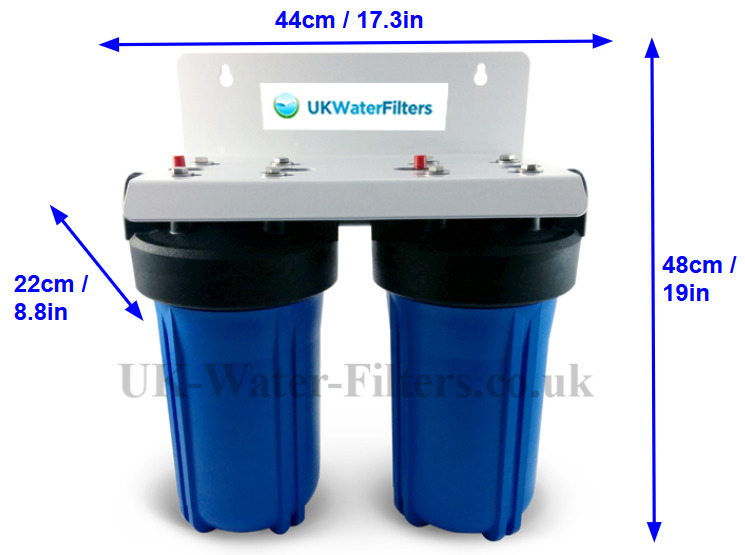 After a couple of problems - which UKWF sorted out very quickly - the filter is working really well. The water is much softer - we are in a very hard limescale area (Romsey). Things are much easier to clean. And it's much nicer to have chlorine free showers and baths. I would recommend this filter to anyone. Where we live, in Croydon, the water is very hard. After fitting the filter the scale build up is almost totally gone from the kettle. No more marks on our glasses or the wash basin and so on. Water quality is excellent. It is very good value for the price. I would buy another one in a moment. I'm happy with this filter. We now get mineral quality water throughout the house. It's really improved our skin and also the limescale. It's really made a good difference. We used to buy a lot of mineral water but have stopped. there's no need. It's great. Deals with the scale. I do see a very small / marginal build up in kettle. But this is over time and it's really not an issue. It's a lot better than before. Meanwhile the water tastes great. I could drink it all day long. It's a hell of an improvement on the Brita drinking filter. I originally got it for the shower. I'd messed up my lungs doing DIY - long story - and they were getting irritated by the chlorine in the steam in the shower. It's really helped that. Finally, I'd say it's really easy to change the filters. I'm happy with it and don't regret buying it. We're in a very hard water area and the filter has made the scale much much better. The water is much nicer for drinking. All my grown up grandchildren like it when they visit. Very pleased with it. It was originally fitted by a plumber. When I came to change the cartridge I did it myself. We don't see any scale anymore and the water is nice and clean, tastes good and is lovely to drink. I used to get rashes on my back and eczema from the chlorine and now since using this filter I don't get them anymore. We are with Thames Water and they use the maximum amount of chlorine that can be used in the water so our water really tastes disgusting. But with the filter I am happy and my husband will even drink it now when it is chilled. I suffer from Crohn's disease so my stomach is very sensitive to chlorine, with the filter it is great that I can drink the water straight from the taps now. I'm trying to recommend you to everybody. From start to finish UK Water Filters have been great assisting me on what I required to checking to see if everything has gone okay and to see if I had any issues. The delivery is quick and for once you are kept upto date on what time it will be arriving so there is no wasted time hanging around. Thanks for the great tasting water. Yes this is a good product. Glad we bought it. Plumber fitted it no problem and now it's working very well. Plumber said was easy to install. Have only had it for a few weeks but can already notice the benefits esp with taste. Crusty scale isn't back after we cleaned before installing. Wife can tell the difference with showering. Arrived quickly, well packaged and installed the following day. Being a plumber myself, it was straight forward to fit and instructions were really useful. Wow! What customer service! The filter arrived ages ago and I'm really pleased with it. I have had this unit fitted for approx. 10 months now and I would recommend it to anyone. Yes it is a fairly large unit and does take up a large chunk of wall space but it is definitely worth it. The quality of the drinking water is equally as good as any other drinking water filters I have had in the past, and that is the quality of the water that the whole house benefits from. The scale removal is very good, not 100% but few scale filters are. Before fitting the filter we were descaling the kettle approximately every month, now the kettle is showing the same level of scale build up as it used to after a week or so, pretty good for 10 months use. The shower used to show scale streaks all over the tiles and screen and the shower head needed constant cleaning, now virtually nothing. The softener side is equally effective, and so much better that our old salt based softener at our old property, biggest problem was remembering to use less shampoo, shower gel etc. for the first few weeks. Yes the filter unit is expensive, but so is a salt based softener and the constant salt replenishment, whilst the filters themselves aren't cheap it is definitely cheaper over a couple of years to run this unit than a salt based softener and a separate drinking filter. Only criticism is that the canisters are very large and very heavy when filled with water, ideally they could do with a drain valve on the bottom to prevent water going everywhere when you come to change the filters. Also the web site says it has 1 inch BSP fittings, it doesn't they are standard 22mm fittings so don't waste your time trying to find 1 inch to 22 mm adaptors. After years of a Britta filter clogging up my drainage board I took the plunge and got a whole house system. I live in a hard water area so the added scale reduction was a no brainer. Instantly improved drinking and bathing water and hopefully longer lived appliances to boot. Top service from uk water filters who answered all of my many questions. Very happy with the new filter. The service and delivery was brilliant. Much bette than the old softener we had. Highly recommended. Very good it's working well. Thanks for the great service! I purchased this filter after seeing it listed here. It was sent immediately. Very happy. Great improvement on the old salt type sofetner we had before.